Location. 37° 5.06′ N, 88° 36.064′ W. Marker is in Paducah, Kentucky, in McCracken County. Marker is at the intersection of Kentucky Avenue and 7th Street on Kentucky Avenue. Touch for map. 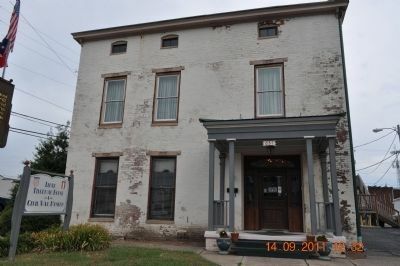 Marker is at or near this postal address: 631 Kentucky Ave, Paducah KY 42001, United States of America. Touch for directions. (about 500 feet away); Visitors Coming to Paducah (about 500 feet away); Spanish American War Monument (about 600 feet away); "Old Judge Priest" (about 600 feet away); 8th U.S. Heavy Artillery (Colored) (about 600 feet away); Grace Episcopal (about 600 feet away). Touch for a list and map of all markers in Paducah. More. 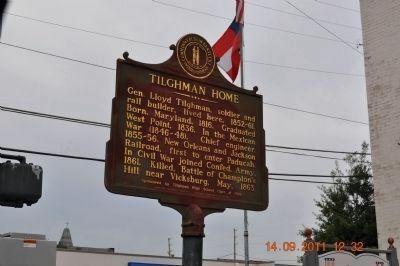 Search the internet for Tilghman Home. Credits. This page was last revised on June 16, 2016. This page originally submitted on September 17, 2011, by Sandra Hughes of Killen, Usa. This page has been viewed 397 times since then and 5 times this year. Photos: 1, 2. submitted on September 17, 2011, by Sandra Hughes of Killen, Usa. • Bill Pfingsten was the editor who published this page.